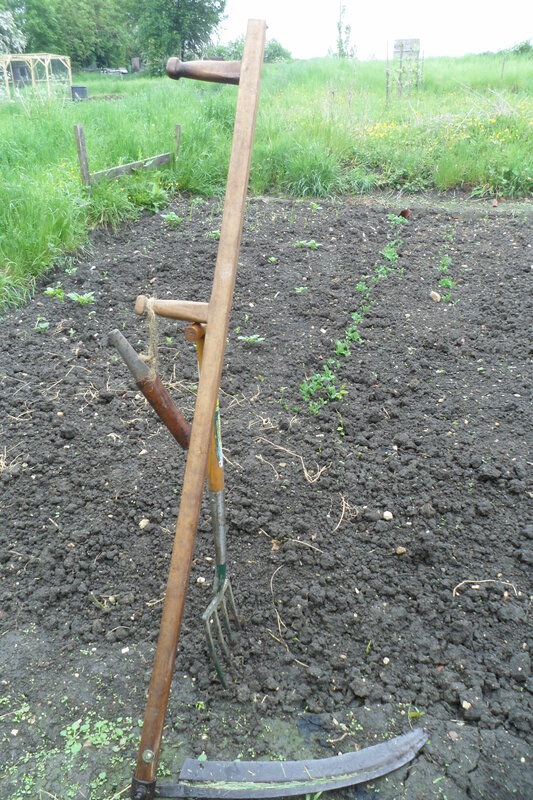 Today it finally stopped raining so I collected my scythe and whet stone and made my way to the allotment. My scythe snathe- the handle – is home made. I wanted a medieval style scythe for my displays. The straight handle is lighter than the curved snathe. I am not the world’s best carpenter, so it is not a difficult task to make a handle that fits you personally. I used apiece of mature ash. The original handle was longer, reaching beyond my head and, as shown in a manuscript painting, I used to hand my whet stone from the top. I shortened the snathe so that it fitted into my small car more easily. 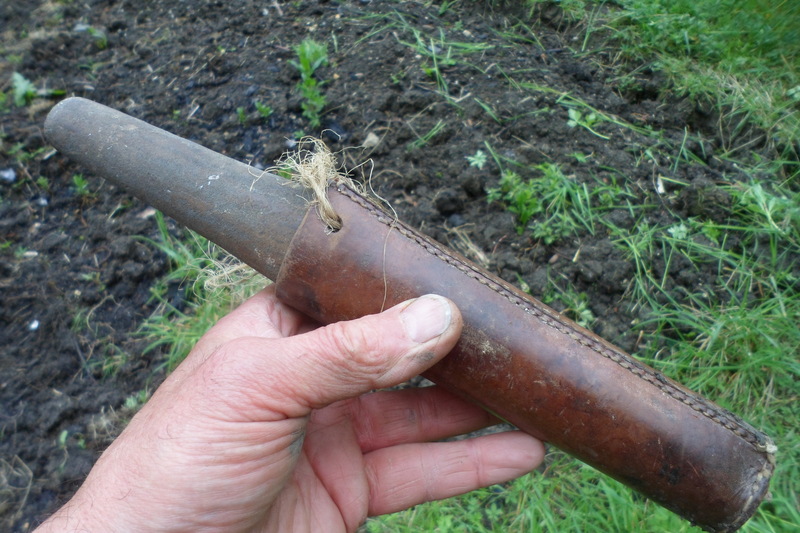 The blade and metal work to hold it in place were taken from an old scythe with a broken and rotting snathe. I shall say more about scythe’s in a re-write of an article I wrote some years ago for the Professional Gardeners’ Guild. My scythe with a home made snathe. The whet stone hangs from the lower grip. The grass was still wet, so unlike for most modern mowers, it was in perfect condition for mowing. The grass was still mostly standing erect which is also good. Trying to scythe through fallen grass is not a pleasant job. I used the wet grass to moisten my stone, honed the edge an set to work. Using a scythe for small areas of grass and weeds is cheaper and less noisy than using a rotary mower, Allen Scythe or a strimmer. A scythe needs little maintenance and will last until you die if looked after properly. It is also safe to use. If you hold on to the scythe you will find that it is virtually impossible to cut yourself. My whet stone and home made leather holder. A scythe is also quiet so you can listen to the birds sing as you use it. The weeds were growing amongst the long grass. there were nettles, cow parsley, docks and buttercups. Not the sort of weeds that you want to spread onto your plot! 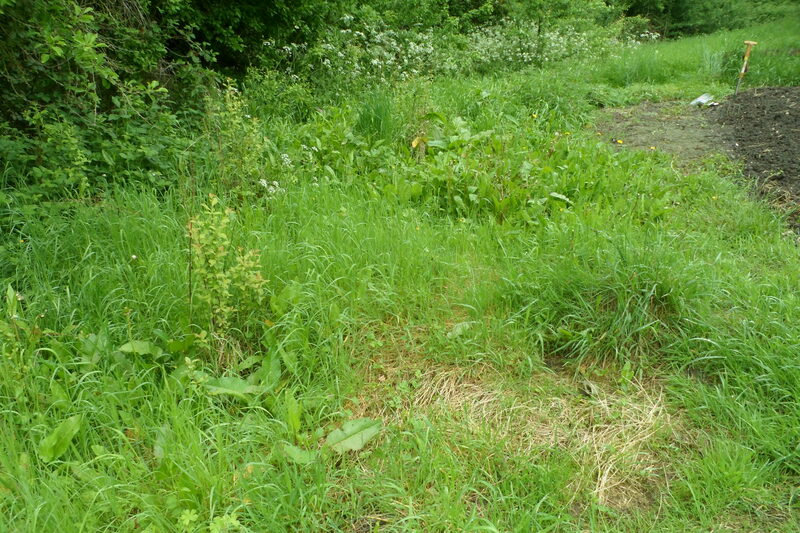 I cut all around my plot and some of the public path where cow parsley had fallen over during the heavy rains. The whole job took little time, I have no idea how long as I never wear a watch when I work on the allotment. I finish when I finish! 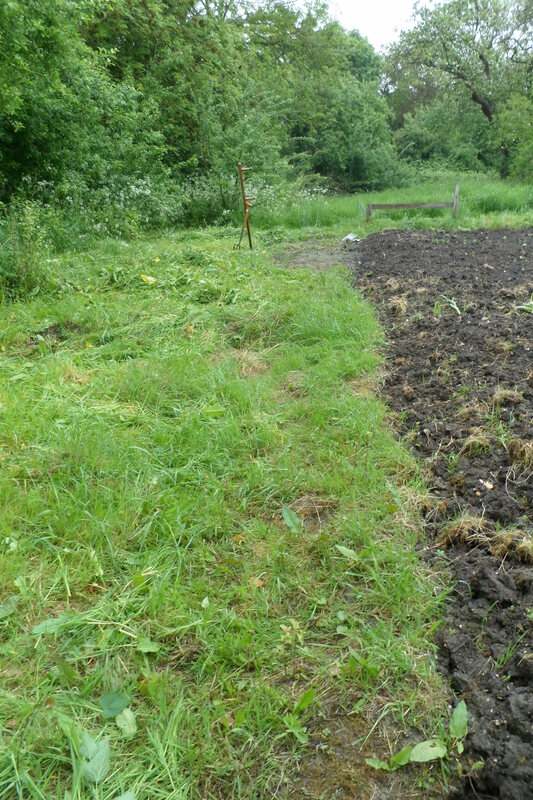 The longest part is clearing up, but a scythe lays the grass in neat rows, making raking up the mown grass very easy. I put all the grass onto my compost pile. The cow parsley and nettles will soon rot down and by autumn I shall have some free compost. I cut down the grass and weeds, but I left a few standing for wildlife. After cutting down the weeds and grass I raked over the clods of soil, which now broke down quite easily now that the water had soaked through the centres. I dug over some of the other parts that I had dug once so that I could break down more lumps of clay soil. Considering I only took the allotment on in April, it is looking in better shape than some of the other plots and my seeds are starting to grow too. The pre-soaked peas are up and the onions sets have started sprouting too. Things are looking good so far and I am making more progress than I thought I would.